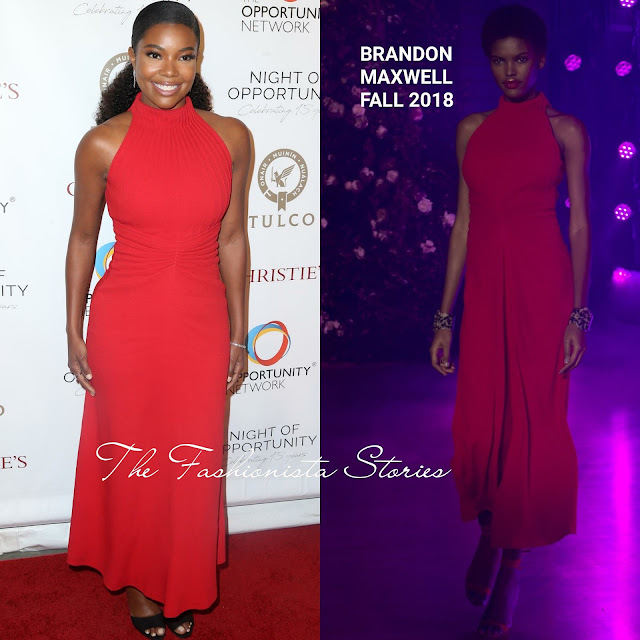 On hand as a honoree, Gabrielle Union attended the Opportunity Network 11th Annual Night of Opportunity Gala last night(April 9th) in New York. On tune with the carpet, she wore a red sleeveless BRANDON MAXWELL FALL 2018 mirror pleated midi dress with a high neckline and a slit detail. This is not a wow moment but the color against her skin looks wonderful and her look worked for the occasion. Accessorized with silver sparkly jewelry & STELLA LUNA SPRING 2018 sandals, she finished up her look with a curly half-up half-down hairstyle.